Learn how to wrap your hands to increase punching power and prevent injury. I learned this from Wildcard Boxing gym. Tested and approved by the pros. 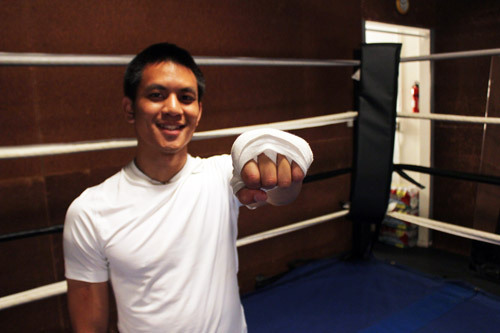 Then handwrap’s purpose is to protect a boxer’s most important weapon, his hands! The hands are made up of many small joints and small bones that could easily fracture from the impact of repeated punches. Handwraps are there to hold your hand together providing support for your wrists, fingers, knuckles, and the entire hand itself. 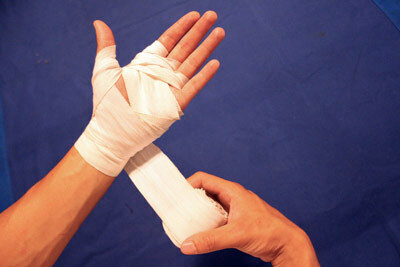 Many people incorrectly think handwraps are for extra cushion or protection for your knuckles. The handwraps are there to secure all your loose joints and moveable bones. The handwrap fastens all your joints together so the shock is better distributed across your entire hand. You don’t want your joints to be moving freely and independently when the hand strikes an object. You can suffer a fracture if joints are moving in their own direction. will tighten into a solid fist when the hand is closed. If your hands are loose when you punch, it’s very easy for small joints in your hand to collapse over each other and break. Even if you don’t break your hand, you don’t want to risk hand injuries that prevent you from doing other things in life like typing on a computer, holding a pen, or carrying things. Save your hands for life after boxing! You go down the back of the hand so the handwrap tightens when you make a fist. If you run the wrap down the front of the hand, the handwrap loosens when you make a fist. It’s annoying to have to re-wrap midway through your workout. This provides support for the wrist. If you have short handwraps or big hands, you can do just 2 times. Some fighters like having loose wrists (for angled hooks and uppercuts). You’re wrapping around the palm of your hand. Don’t worry so much about covering the knuckles. Bring it down to the back of your thumb. Now you begin to create X’s on the back of your hand as the handwrap goes between your fingers and crosses the back of your hand. This part pulls your knuckles together for support but keeps your knuckles separated so they don’t collapse or break over each other. Wrap between your pinky and ring fingers. Now over to the side. Now down to the bottom of your hand. The handwrap forms an “X” on the back of your hand. Now back to the top of your thumb again. Now between the middle and ring fingers. The second “X” is formed. Now the third and final “X” is formed. All fingers properly separated. Finish on top of the thumb. Go once around the thumb. Now go down the back of the hand. Go behind the thumb…pay attention carefully to the next step. Now go around the knuckles. If you still have extra wraps left over you can do some more “X’s” around the back of your hand. You can also wrap the knuckles some more. Don’t wrap so thick that your hand won’t fit in the gloves. Finish at the wrist. You can secure the velcro right on the wrist for maximum wrist support. Some boxers like to finish above the wrist so their hand can bend a little more for hooks and uppercuts. Congratulations! A perfect handwrap. Isn’t she beautiful? Go ahead, admire your work, make a fist. will tighten your fist when you close your hand. Everything should feel good. The hand is relaxed when you’re not making a fist, and tightens when you close your hand. If your hands hurt after just 30 minutes or your fingers are turning white, it’s probably too tight. There are many ways to wrap your hands. As long as you’re protecting your hands and properly securing the bones together, that’s all that matters. Tight Wrist vs Loose Wrist. Some fighters love throwing more powerful straights and will concentrate more wrapping right on the wrist. 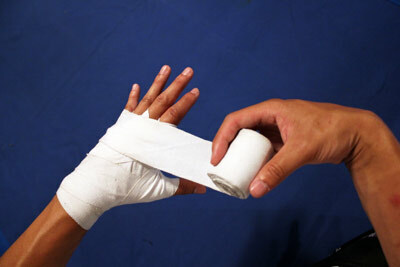 (Some fighters will put one layer of tape around their wrists right before wrapping their hands for a stiff right hand.) 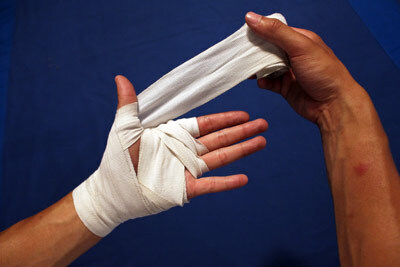 Other fighters want less wraps on their wrists to allow more flexibility for hooks and uppercuts. Professional fighters do wrap their hands a bit differently. They use longer wraps and add extra padding for their knuckles. The need the added protection because of how hard they punch and how long they’ve been boxing for. Thanks to Pepper Roach (Freddie Roach’s brother) from Wildcard Boxing Gym for teaching me this. After learning 3-4 other ways of wrapping my hands over the years, I have to admit this method is my favorite. I call it the “X-method with the thumb-lock”. 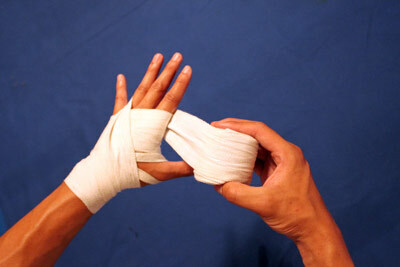 Wrapping the hands is every boxer’s daily ritual. It’s the ten minutes where every athlete/student/office worker transforms into a boxer. 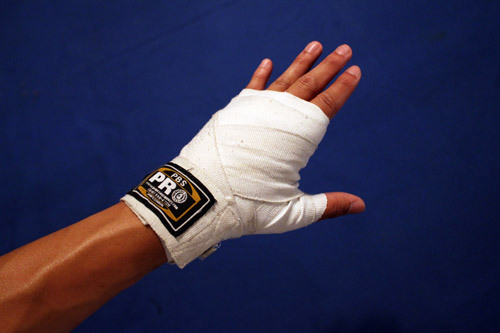 Do it right to protect your hands for use inside and outside of the ring. For those who keep asking, these are my favorite handwraps! agree that this is the best method for wrapping hands. Much detailed and understandable! In the end we saw your face bro 🙂 Again very helpful article and with the pictures and videos its wonderful. Sometimes things are too complicated when try to tell with words and one image can tell everything easily. Best source on the web about boxing, i learn a lot from you, keep up the brilliant work up. I have small hands, and consequently my wraps have always looked like a ball of sweaty cotton candy jammed at the end of my arms. This method is better. I have been waiting on this topic for awhile because I knew I was doing it wrong. I can not wait to try it out! This is the fault of many (boxing) gyms&coaches. Some don’t even bother showing people ways on how to wrap at all, or they show more ineffective ones. When I first started in full contact sports (for me it was Muay Thai, Boxing came many years later) I was shown a technique were you layer way too much of the wraps over the knuckles (basically layering them from left to right or vice versa without going all the way around until you fasten it), rather than doing that later with extra gauze and fastening with tape. I am glad I was finally shown better ways & techniques, and this is actually a good one, especially for women and guys with smaller hands. Or another way to put it, this is a good method for those training in big gloves. @Radd – no more phantom! More detailed videos to come, guys. @everyone – I’m glad you guys liked it. More stuff to come! finally I saw your face 😉 you are handsome, man!!! closing fist while wrapping around the fist? my trainer tought me to close my fist while making wraps around my knuckles and wrist. And open in only in wraping X’s around my fingers and around the thumb, so that i will have a secure wrap around the fist. how true is this statement? or it does not matter wether closed or not? Mingsy the cat: You can’t use just tape anyway, since afaik it is actually illegal to put tape directly on the skin and it’s also illegal to tape over the knuckle area even with gauze/wraps underneath (you can only fasten the area in between the knuckles by putting tape in between your fingers). I’d have a hard time explaining how to properly do it in the space of a comment, especially considering that English isn’t my native tongue. I suggest talking to guys who work the corners of professional fighters and let them show you how it’s properly done. I can wrap and tape for myself, but you’ll always get it done in a better way if you have someone else do it for you. You can close your fist and open while wrapping, do I don’t recommend it. Most people I know (incl. myself) leave it open until the wrap job is done. Once you get the hang of it and get really good at it, the wraps are such a perfect fit that they can come off like a glove when you take the Boxing glove off 😉 (though that doesn’t always automatically mean it’s a good wrap job, keep that in mind). @mingsy the cat – I guess you’ll just have to try it both ways and see. I like having my hands open because it feels more snug and makes a tighter fit. I don’t know how to wrap for professional boxers because I’ve never needed it. Great website been following for a while and you got very good points and topics, is hard to teach and motivate at the same time I use your website to have my fighters doing researching and learning, thanks for your time and your insights in boxing. Again thanks and keep it up. Oh boy… I thought I had a good way to wrap my hands, but this one if way better. I even did the first step wrong haha, that’s why my wraps became loose sometimes… thanks a lot for this. this line “It’s the ten minutes where every athlete/student/office worker transforms into a boxer.” really, really hit me. Right here *points to heart*. I never really thought about it like that. I usually put on my wraps with such haste that each time is a lil different but always sloppy. Fantastic article again. You seldom find people who post instructional articles/videos with so much heart. 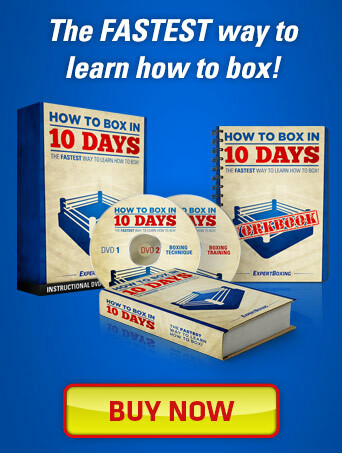 Absolutely mint guide, now I can wrap my hands properly and the guys I box with have learnt from me… Legend, the site is super informative… all round winnner! @Wills Sung – Putting on the handwraps was always the moment I became a warrior. It’s nice to see others sharing the same view. Thank you. @Luke from Oz – thanks, Luke! dont we need more wrist support at the end? @grindo – yes, you can definitely put more on your wrist if you like having more wrist support. I was wrapping my left hand so I like having it loose for left hooks and left uppercuts. 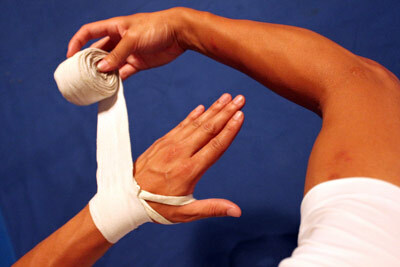 You can wrap more around the wrist and/or also put one loop of tape around your wrist before wrapping your hands. That will keep that wrist nice and tight for those straight shots. Johnny N I guess it also depends on how you throw the hook, since there’s the “European” style hook and the “American” style hook, where one you put your fist/glove horizontally (European) and in the other vertically (American). Ive been waiting for this since ive started reading a year ago. Great work!! I am so grateful. Keep it up. @max – I’m glad it was worth the wait. I hope you kept your hands wrapped all that time. haha. I Love this wrap, it makes my hands feel like clubs at the end of my arms they’re so secure! Thank you for all these great articles. I’m new to boxing and just got my first hand wraps. I’m not sure how tight the hand wraps should be. Is it normal to have many hand wrap lines on my hands when I take them off? Does wrapping your hand tighter protect your hand more? Should I be pulling the wraps against my hand, be simply placing them on my hands, or using an amount of pressure in between? My son’s boxing coach says he likes to wrap my son’s hands very tight for a fight enough to make them “numb” so that he (my son) dosen’t feel any pain in case he injures them in the middle of fight. However, my son dosen’t like the feeling of the numbness because he hates not feeling how he is punching. He also feels his punches aren’t as strong and powerful. Who is correct….my son or his coach? Thanks for your help! I agree with your son. He’s young and doesn’t have damaged hands so why wrap like they are [damaged]? As long as he’s using proper form and fighting with heart, I think he’ll be ok. Comfort has a lot to do with the fight performance, too. Wrapping too hard actually HURTS me…it’s not like they go numb right away. thank u again for this article what may be simple and nothing to some, little guys like me truly appreciate stuff like this. A very useful article.I’ve tried cheap Lonsdale gel gloves and couldn’t get on with them as the side of my hand started aching,then I switched to gel wraps.I’ve injured my thumb and every time I knock it my thumb aches and it takes a few days to get back to normal.After watching this I’m going to get a proper set of elasticated hand wraps like yours.I think the gym I go to should realy explain the importance of wraps and how to wrap properly.I will practice putting them correctly after reading this article.Thanks! You will definitely feel a difference with proper hand wraps. Let me know how it goes, Paul. Thanks for this. I do have a pair of gelwraps I use for light bag work before work in the morning. However, I do use the traditional ones for heavy bag work when I have more time on weekends. I tried many handwrap techniques (about 3-4) and this is far the best ! The Expert Boxing website is by far the best and complete one out here. Thank you a lot for doing this – it is very helpful. Actually, I found your website while looking for Muay Thai Kickboxing info. 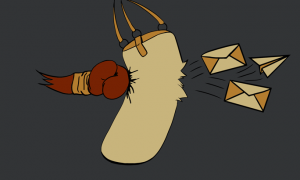 I think it would be very nice if you decide to add Muay Thai section or blog sometime in the future. There are many Muay Thai websites but none of them as good and helpful as yours is, not even close. I’m sure if you start a Muay Thai website it’ll be greatly appreciated by many. Can you show me examples of the best Muay Thai/kickboxing sites you found? I’m curious to see what they talk about. I have no knowledge of kicking but I do have some Muay Thai friends. Thank you for the support and reading the site. It’s an honor to be a resource for other types of fighters! After I read this article, I haven’t been suffering from wrist pains after throwing incorrect punch so thank you Johnny. its a handy little gizmo…. I love you man. (no homo) this way of wrapping is amazing. And your website is just great, keep up the good work! I love these. They’re great for wrapping INSIDE your handwraps. They feel nice and offer good cushion but not much structural support for your fist (meaning, they don’t tighten your fist together very much when you punch). Great resource, J! Thank you for the link. is there anything wrong with using cloth wraps since when i went tog o buy them they were the only ones they had and does this method work if im putting on mma gloves or should i find a different technique? I’m not an mma fighter so I won’t give you any advice there. The method above is for boxers using boxing handwraps and boxing gloves. I’m not sure what you mean by “cloth wraps”, but I use cotton. This Article changed my life, Like, forreal. Can you make one that uses a 70″ wrap. I already bought these and I didnt know they had sizes, now all the instruction videos are using 108″ up. Please help, thank you. 70″ is like a kid size I think. It’s not really possible to properly wrap your hands with something this short. I guess you could follow the guide but wrap it less around your wrist, and palm, and knuckles. well although I have small hands, I bought 120″ wraps and for this wrapping technique are way to small. 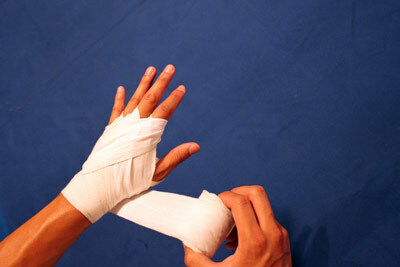 I`ve tried wrapping less in wrist and knuckles but still no go…! There are way to small ! Can you please suggest any wrapping technique for boxing using 120″ wraps ? If the wraps are too small then the wraps are too small. Either you have to get longer wraps, or not be able to properly wrap your hand, or shrink your hand. I believe only one of those options is a good one. shrinking the hands will do! ( I knew it that the wraps were good) ! what a beautiful quote man..
hey johnny if you wer to wraps your hands with tape,gauze and handwraps..how would you do it? when i do it i usually grab a gauze first and tape it into my knuckles and a little bit tape on my wrist for extra protection then i do the 180 mex handwraps…. I will be making another guide on this for the fancy way of wrapping your hands. It’s only for amateur competition AND/OR if you’re a pro. For everyday amateur training, it’s really unnecessary. Sounds like you’re spending too much time on the heavy bag. 3-6 rounds a day should be the max. Hand grippers, squeezing raquet or tennis balls, fingertip pushups, hanging from a chinning bar for extended periods, exercising on monkey bars aka horizontal ladders, pullups/chinups, using wrist rollers with a weight hanging by a rope, deadlifts and partial deadlifts or simply just holding a heavy weight, thumbless-grip reverse barbell curls, pinch gripping barbell plates, etc. There are tons of hand/wrist and forearm exercises out there. I’ve seen martial artist take cinder blocks and drop and catch them repeatedly with either both hands or single handed. Also any of the Olympic lifts are great for conditioning and strengthening hands but if you don’t wish to lift weights the other non-weights exercises are great also. i played rugby for 4 years , and now i decided to try boxe. but there’s a problem; my knucles really hurt and i almost can’t close my right hand , because i have more strenght in my right arm, i punch harder with right hand. i started boxing recently i don’t know if this is because i don’t wrap my hands properly or if it is because of the gloves i use (10oz) or if it is just because i’m not used to it… and i have small hands, that’s why i don’t know if i should buy 12/14/16oz gloves. A puncher with small hands will quite often develop hand problems. Try placing a small sponge across your knuckles before wrapping your hands. 10oz is way too small for regular bagwork. Please read my articles on boxing gloves and choose the size based on your body weight. sometimes i see fighters get athletic tape and tape just the wrist and knuckle, whats the motive for that? More support and/or more power. Sometimes people do things because that’s the way they learned it. Whats the best thing to do for sore knuckles? Specifically the pointer finger knuckle. Great article as always. I have been a fan of your site long before I actually started boxing. I learned how to wrap my hands from this article in the beginning. But I have always had a problem. I use 16 oz gloves ( I’m 174 5’6″) and still when I punch the bag it feels like my hands don’t have enough protection form my knuckles. My jabs are fine and my right cross doesn’t worry me that much but when I through a hook or uppercut it feels like I don’t even have gloves on half the time. I know my for is right and I’m not hitting with my hand at an angle or any thing like that. And if any get any more wrap around my and if I won’t to close my fist or get my hand in the glove. Any tips that I have over looked? Throw your punches in slow motion and see what angle your wrist is bending at. Hooks and uppercuts can be tricky to throw at a safe angle on the heavy bag. Thanks for the tip. I took a little while but I figured it out. I was wrapping my hands to tight. Thanks agen. I have seen a couple of Youtube vids advising to not even use the thumb loop, as it will cut off the circulation in that area. What’s your take on this? Thanks..
Not true at all unless you’re wrapping your hands too tight in the first place. The loop releases a bit when your hand is relaxed in the glove and then tightens as you tighten to make a fist. You should not have any problems using the loop. What to think of Knuckle Guards to use under handwraps for better protection ? Most people don’t need it but you can wear it if you like. Johnny I have a 120 handwraps , I am just before wrapping three times around the knuckles in the end… would I have to buy another handwraps or just change the handwrapping method ? 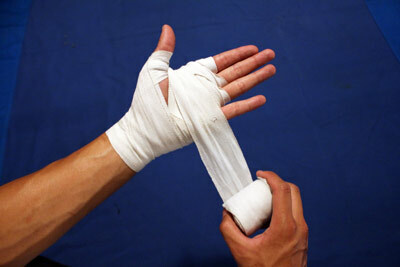 You need longer handwraps, or change your wrapping method. Very nicely written, detailed article on how to wrap one’s hands 🙂 Even complete novices like me can get it in a couple of minutes. I can afford to buy the 180″ inch wraps 🙂 I just didn’t want to waste the short wraps I found lying around the house. Thanks for any thoughts you will share 🙂 I’ve been promoting your website to friends who are also trying to get into boxing. As long as you get the same results, I guess it doesn’t matter how you do it. But if it were me, I would use 180″ wraps for the convenience. Having to roll-up and wrap twice as many wraps every session would add up to many wasted hours. Thanks for the video – really helpful and useful technique. I have a question for you though – I wrap up during practice, and we usually pair off so one person hits and the other person holds pads, then switch. Whenever I’m holding pads the straps on the backs of the pads start to pull off my handwraps, so by the end of the practice they’re starting to come off. Any suggestions? Am I wrapping too loosely? I really don’t know what’s going on because I don’t have that problem. I guess the only way to know for sure if you’re wrapping too loosely is to wrap it tighter and see what your results are. Maybe your gloves need to be broken in a bit. I would also recommend trying other gloves to compare how they fit differently. I bought 180inch wraps from the boxing gym I started going to for $6, problem is that it doesn’t come with the loop. Is having the loop crucial? And how do I do this kind of wrap without the loop? I would go buy new hand wraps that come with a loop. After you wrap your hands, is it mandatory to put on boxing gloves when fighting? Ex. If you’re in a street fight can you wrap your hands and go or are the gloves required? I don’t think there are any rules in a street fight. Sir do you have boxing tips for street fights?^_^ and to protect your fist on a street fight without handwrap? No, I don’t have any tips for streetfighting. Can I punch the bag while having handwraps or do I have to have gloves? Gloves absolutely. Especially if you’re a total beginner. I can still type with wraps on! Feels great, wish I knew about this years ago. Then you need longer wraps? Or perhaps you need to use a different method that doesn’t wrap around the hand so many times. Tuan, I bought a pair of elastic 180” Everlast hand wraps, and I think they’re shorter than my 120″ non-elastic ones — so I guess they’re supposed to be 180″ when they’re stretched out. But the problem is that if I wrap them too tight it hurts, and if I wrap them less thight they’re too short. Been trying and trying and still can’t get it right. Hey thanks for having this up it helped me i feel so much more support using ur method…..jw am like 5’6 so i dont have big hands i use 108 wrap do u suggest i use a long one for more suppport cuz i do have wrist issues so i think i cud benefit from more protection what do u think? 180″ is the standard length and what I recommend. Best instructions I’ve found online! I ended up c&p it, removing the background, and fitting it on two pages so I can practice it whenever I have time. Hi there, great guide and clear instructions. So good I have added a link to your guide from the hand wrap product page on our website. So many of our customers still need to learn the importance of proper hand wrapping Boxers and Martial artists alike. I hope you don’t mind sharing your guide. You’re more than welcome to link back to my site as often as needed. Good luck with your site, Alex! The pictures of how to wrap are great…..but how about the same pictures wrapping the right hand? It may seem like a simple thing (just reverse), but it’s different. I don’t want to re-take the photos (because I think it’s unnecessary for people to see the same images over and over) but if you need for your own personal collection, you’re welcome to download the images to your computer and flip them yourself. You assume I know how to do that, eh Johhny? But I have another question. I started hitting the heavy bag about 6 weeks ago. I’m not wrapping correctly, not enough padding in the gloves or something else? It’s either poor protection, poor technique, over-training, or some combination of the aforementioned. If you’re just starting out, take it easy and give it some time, Darryl. Hey. I dont box but i street fight more then i practice on a punching bag or in the ring, is it still good to wrap my hands? Past week just practicing on a bag i fractured my knuckles no wraps just ufc brand boxing gloves. So in a street fight the wraps will help prevent injury but will it also cushin the punches? Or could i just use alittle less wrap at the knuckles. 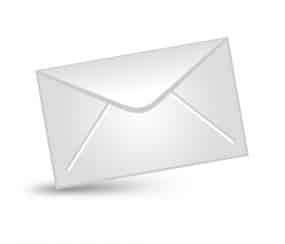 I dont get on my pc often but my emails get sent to my phone so instead of replying here could you email me your response? Would be much appreciated. 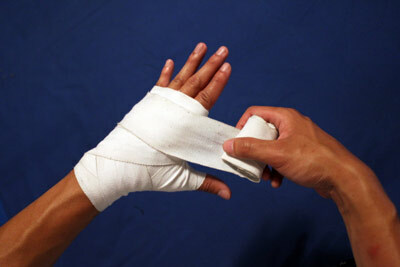 You need to wear handwraps in order to protect your hands. The handwraps are for securing the bones in place, the gloves are for cushioning the impact. Using both will help. Hello! Thank you so much for all of the information you provide on this website. I’m a 46 year old mother of two who bought a punching and speed bag set-up about seven years ago. I loved it. Trial and error (plus some tips from the kid across the street) eventually allowed me to hit the speed bag with relative accuracy. Only problem? Arthritis. I did know enough to get gloves, the wrong ones according to what I’ve read on your site, which explains a lot, lol. I had to give it up partially due to tearing my hands to pieces, partly to a move to a smaller home. A few weeks ago, I bought an item billed as a “reflex bag” at Wally-world; it has a heavy metal spring at the bottom, and flips around when punched. Small footprint, so we could set it up here in the house. My boys, ages 9 & 11, love this thing, as do I. There is an absolute “no glove, no use” rule here. Should I tape/wrap the kids’ hands before they use the bag? I was taken aback by the force with which my nine-year old hits this thing. Your site is now on my toolbar; I finally have somewhere to look for instruction! This is one interest all three of us hold in common, whether the boys’ interest continues further or not, I don’t want them developing bad form and habits that will be difficult if not impossible for them to break later in life. Ok say i fight someone out on the streets just the wrap is good? Aslong as i wrap my hands correctly ill be fine. Ive got meister mma 180 wraps, i love them. Seem to be semi elastic like whats shown in the pics and when i make a fist i can definatelt tell my hand feels more solid. Thanks for the help. Ill check back regularly and see how the site is doin. Peace. I would say the wraps aren’t enough but it’s better than nothing. There’s still a big risk you could injure your hands unless you wear gloves. Ok so the wraps help but gloves are better. Hmm alright thanks Johnny. I was taught from a young age not to wrap between the pinky finger and ring finger as this could hurt your pinky knuckles. Any thoughts as to the pros and cons of doing/not doing an “X” through the pinky finger? I feel there’s more support putting some wrap between those two knuckles. But you’re welcome to try it without and see how you feel. It’s like those knuckles should be taking the impact anyway. this is what i am looking for…a detailed info..tnx.. When I started into boxing, I surf the web a lot for tips. And then I saw this website. It’s so cool. I follow most of your tips/guides/do’s and don’ts and etc and even your proper exercise for a boxer. I’ll try to enroll soon in a real boxing gym around my place. Elorde gym (Philippines) is kinda far from my place. (But I have a few of their GC for an hour of intense boxing – will use them soon). I only get to practice boxing by myself. Self-help you know. I got my gloves/mma gloves, hand wraps, punching bag and etc. I think I get to love it more even I’m learning by myself. And I love it as it makes me strong and more fit. Proud to say, I followed your tips in snapping more than hitting when puching the bag. I think I’m doing very well when I videoed myself to see how I’m doing. Again, thanks for this website. Keep it up Sir! Hey Johnny! This tutorial is great! The only problem is that i have big hands and thin wrists. When i complete wrapping my hands, It feels too tight and it feels like it is cutting out a bit of blood flow, and it is a bit of an awkward feeling. Is it meant to feel like this? Or am i wrapping it too tight? Sounds like you’re wrapping too tight. Loosen it up a little. Great wrap. I am right handed n find it easier to wrap this hand first. I used this method for today’s heavy bag session, loved the feel but afterwards I have a blister and some bad (what looks like rug burn) between my ring and pinky fingers. Could this be from the tape being to loose? I didnt make them to tight, bc I wasn’t sure what would work better. Maybe too loose or too tight? Change it up and see what happens. Thanks johnny, your amazing man .I never thought wraping could be so easy because im new to the whole boxing thing but your website really helps alot ,but again thanks alot you really inspired me. One more thing ,I dont know what size wrap I should get because I think I have small hands just like you too,can you please help??? 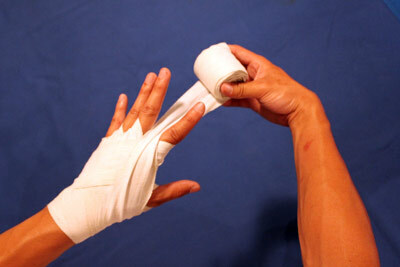 Hey Johnny, I am thinking about posting a How To hand wrap video to gauze and tape your own hands. 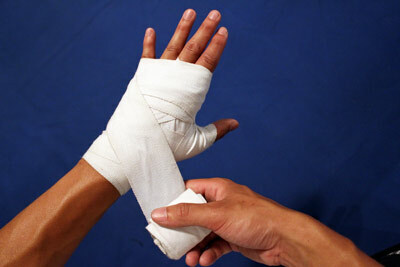 Basically the method I use when I don’t have someone there for my fights that can wrap better than I can. Just want your permission to post before I do. Sure DRVerges, you’re welcome to post! However, for those that are less experienced and maybe have a boxing or MMA match and your trainer is either not there or doesn’t know how to wrap hands, this method is how you can wrap them yourself! 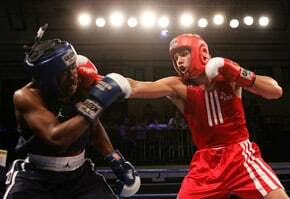 I’ve had my own hands approved by USA Boxing and have confirmation letters of approval from several state commissions. Any questions, comments, etc, reply here or pop a comment on the video. Very cool website, DRVerges! Thanks for the video share. Thank you for this article. I’m a martial artist and I’ve never needed to wrap up before but after having a bad accident(not fighting related) my wrists and hands have become quite fragile and punching is painful. Knowing how to wrap my hands properly is amazing. I cant believe the difference it’s made. I can punch like I could before and there’s no pain. Thanks, keep up the good work! Hey jonnhy , the other day a little bone in my hand starded hurting by my knuckle , everytime I punch the bag hard it hurts . It’s like a little bone or 2 , around the 2 knuckles closest to the thumb.I would say it was my knuckles that hurt but im not sure . Well if I try to pick something q little heavy with the 2 fingers where I feel this little pain , it hurts. And it really bothers me . Its nothing that serious but I wonder if you have had this before and if it went away with a little rest or anything ? If you also know a name for this can you tell me it ? I’ve never had this problem before and I’m a bit worried about giving you bad advice. Perhaps you can check it out with a doctor or chiropractor. Or physical therapist? This tutorial is really helpful for a first timer like me. I had to watch the video many times but I have finally got the hang of it. I’ve been going all out on the heavy bag without wraps lately and have been getting persistent pain in my hands, wrists and forearms, most noticable with a right cross. Can’t wait to try it with my hands wrapped to see if it helps. This site has provided me with a lot of really good tips and techniques. Thanks and keep up the good work. Your video finally convinced me to switch from the 108″ wraps to the 180″ and the difference is tremendous. I don’t feel the same twinges in my wrist when I uppercut. Great site! Great job with the article! I had a question but bleeding knuckles and I am never sure where I should ask questions. I know that wraps aren’t meant to protect your knuckles but I was wondering if different ways of wrapping your hands could affect the knuckles. I have a bad tendency for my knuckles to get busted up which causes issues so I have been trying to figure out what I can do to fight it. I rarely use anything less than 16 oz gloves but I have to deal with the problem pretty frequently. Any tips would be much appreciated. Thanks! Try putting some padding on your knuckles. Wow..Johnny Dis Site Rocks..Im A Beginner Nd Ive Been Practicing Recently With Expert Boxing Tips..Nd I’d Say They Re Great..Also Luv Ur Consistency Of Replyin To Comments…Great Job!!!!! What is the brand of hand wrap that you used in this example? It’s a semi-elastic cotton from PRO BOXING EQUIPMENT. Nothing special. Joachim, sounds like you’re form wasn’t quite right. Did you bend your wrist up or downwards when it hurt? I think it is the only explenation that it was bend, it goes that fast That I need to concentrate more on the form… and less on the hitting hard. Same can be said for punches. Better to perfect each one and build gradually. thx James, I also started some exercises to get more wirst muscles. It it legal in amateur boxing and training to use two 180 in wraps for each hand? So 360 in total for each hand. One of my buds was recommending I do so, but I want to make sure that’s allowed in competition before doing so. If you’re amatuer boxing in the states most likely you’re registered with USA Boxing, and I’m sure you can not use that much wrap, it states in the rulebook for Valpeau Spec wraps, max length is 14.75 feet. You can find this info on the USA Boxing website. I find it disturbing that my trainer saw my gel glove hand wraps and said “those are good hand wraps, let’s you focus more on wrapping your wrists”. Also, gel hand-wraps were more expensive than regular wraps, and the person at the store told me they were better. These factors combined with my trainer’s comment made me think the gel was providing great ‘protection’ for my knuckles. My trainer never once mentioned the actual purpose of hand-wraps. After 3 months of numbness and tingling, I did some research and realized how wrong I was. However, I found lots of conflicting info. Perhaps you could do a video discussing gel hand-wraps and the confusion and hand damage these are causing. There were no good videos on Youtube and no authoritative sources, such as this website, to give a definitive answer. Thanks for clearing this up for me johnny. Thanks for this excellentn tutorial. I’m a former black belt (haven’t trained in about 13 years) who is getting back into heavy bag work as part of a fitness regimen. I wanted to do it correctly, and this, combined with a good set of heavy bag gloves was step one. Having my hands wrapped properly makes me want to punch. It was a surprising sensation. I assumed it would be a chore, but wow… Once the wraps are on… Magic. 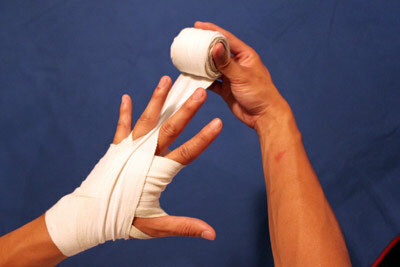 Great advice on hand wraps. My punches feel stronger than ever! I just started boxing about a week. I would like to know if the wraps is only for bag gloves or it can also apply for sparring gloves. Also, I have a small/medium bag gloves but I weight 170lbs and I read that for someone who weight 150lbs+ I should get a Large bag gloves. How will this affect my hand? Is there such a thing as overwrapping? It doesn’t seem like it from the video, but want to make sure it’s not detrimental (hands too clunky or immobilised, etc.). My hands aren’t very big, even for a woman– I’m afraid I’d be doing a lot of creative things to use up an entire 180″ hand wrap, and I’m not sure if there’s a point at which too much is too much and I might look into getting something shorter instead (150″? ), or if any number of wraps is fine and so 180″ would be okay. Thank you so much Johnny! You’re teaching me so much!! I’m just starting to box, and I’ve been on your site 24/7, it’s one of a kind! I love you! Hi, I was looking for Muay Thai and found your site instead! It’s a great resource. My question is I broke my arm as 11yr old, now I’m 22 and been training Muay thai for sometime, every time I throw a left hook/uppercut my wrist/forearm hurt. I have a metal plate in my radius, is there a hand wrapping technique which will aid me with my issue? For example using gauze before wrapping or as in this video you had extra wrap shall I wrap more round my wrist/forearm? Ouch, Shak! I’m really sorry. I wouldn’t have any expertise or credibility in that as I don’t know what bone broke and what your doctors recommend and what not. More padding and wrapping everywhere would be better than less, I assume. Would you consider putting up a video on how to use Le Roy original wraps, or one on incorporating knuckle guards into your wrapping? I don’t use them so I don’t have too much experience with that but there are some great videos online showing how they do it. I’m a long time training now, and this article really improved my hand wrapping. Stumbled across this article while trying to recover from a hand injury. I’m suddenly a lot more protected! Thank you from Ireland! So glad I came across this site. Very useful details and instruction. My hands felt much better after wrapping this way. Thanks for sharing your knowledge and expertise! We spar very light at my gym. Is it still a good idea to wrap up for light sessions? If so can I ask why? If you’re sparring so light that you don’t see the point, then I guess you’re fine. But the experienced boxer in me just wants to say, “Stop being lazy and put safety first.” It’s because of beginners making beginner mistakes that they get injured all the time and make our sport look bad. With all respect this guide is very controversial. All pro boxing trainers I have met have always advised against pulling the wraps between the fingers. It will strain your fingers during impact and cut off blood circulation increasing chances of serious injuries. 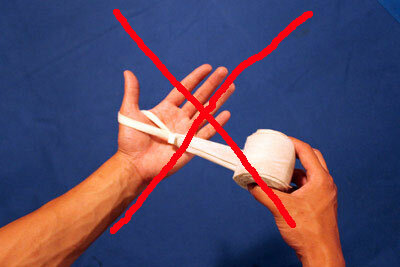 If you want to keep your bandages in place it’s easeir to use sports tape between fingers. Thank you for sharing, Miguel. I learned this method at Wildcard Boxing Gym, home to many famous boxers and professionals…if anything, probably among the top 2 celebrity gyms in the US & World (the other one being Mayweather Boxing Gym in Las Vegas). I think there’s truth that if you wrap too hard between the fingers, it could cut off blood circulation. Then again, you could cut off blood circulation wrapping too tightly with any method, really. I recommend everyone to seek out different professional trainers and try all methods. I personally liked this one the most which is why I shared it. Wrapping between the fingers feels more secure as it fills the space and secures my fingers in place. Angelo Dundee is the trainer who tought me to never put the wrap between fingers. I guess these days lesser people know him and the many champs he produced. He did things different than others and that made him very successful. Let me tell you one thing. I came to his gym in North Miami Beach on 163rd Street at Allen Park when I was 16 years of age and he just let me train there. Not that I was a good fighter, but we had a common friend. When I got started he asked his co-trainer to wrap my hands. First time in my life my hands felt like hammers. Other things he did different: There was no workout on pads or mitts. Just bags and speedball … and a lot of shadow boxing. Great times and I would say the best hand wraps ever. Hi Miguel, what were the reasoning behind for no mitt works? Thank you. Hey partner, I was scrolling through a few of your articles… But I can’t find one to answer my question. MY IMPORTANT QUESTION IS will boxing permanently damage my hands *even if I use adequate protection (gloves, wraps) and proper form/techniques* Also what hand wraps do you recommend? I just started boxing and have had my hands wrapped 2 ways. I like the way you showed best. I like the x style because the wrap felt better on my hand and it also felt like it was more padding and secure.